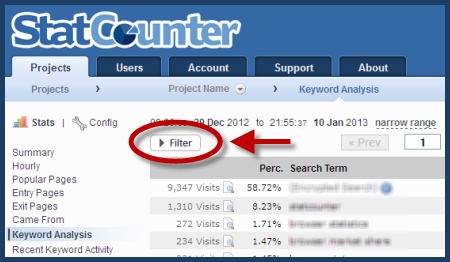 New Feature: Filter – Statcounter Blog. What search terms are Canadian visitors using to find my site? Which US states do I get most traffic from? Which pages on my site are most popular with visitors from London, England? Click “filter” on the Keyword Analysis page to access the available filters for this statistic. ——————————–Use the “search term” filter to isolate keywords (or groups of keywords). 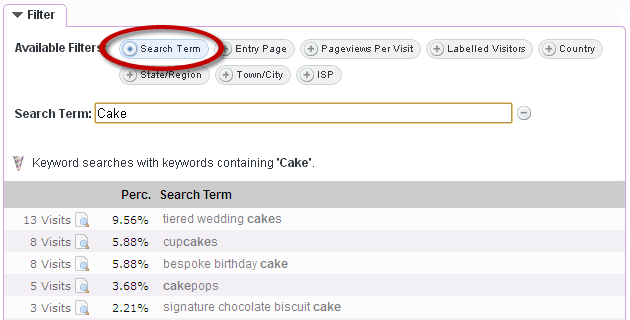 In the example below, a bakery website uses this filter to examine those keywords in their stats which include the term “cake”. ——————————–Use the “entry page” filter to identify which keywords result in hits to specific entry pages (aka “landing pages”) of your site. 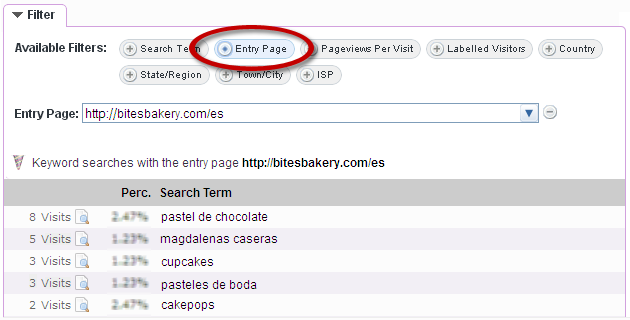 In the example below, we examine which keywords result in hits to the Spanish language landing page on the bakery website. ——————————–Use the “pageviews per visit” filter to exclude bounce visits (visits with only a single hit). This helps you to identify keywords which result in visitors viewing two or more pages of your site. ——————————–Use the “labelled visitors” filter to isolate the keywords used by the visitors you have labelled within your StatCounter project (Note: the “labelled visitors” filter is hidden if you haven’t yet labelled any visitors in your project). ——————————–Use the “country” filter to review the keywords used to find your site by visitors from a specific country. Filters are available on all of the most popular stats pages on StatCounter, and some stats pages have extra filters relevant to the stat in question. We’ll be continuing to expand the range of filters available as well as the stats pages that are covered by filters. We would be really grateful if you could take some time to have a look at the new filter options. Let us know what you think. Any questions on what the filters mean? Any confusion on interpreting the stats? Is there another filter that you would find useful? What other options would you like to have available? Your feedback is vital and will be used to refine and improve this new feature. Thank you folks. – The example bakery site and related stats used in this blog post are entirely fictional. – The filter feature is under ongoing development – expect changes and additions. That will be helpful in finding specific kind of results, much easier way. I am using StatCounter in my blog to use new features introduced by your company. I love StatCounter – can’t wait to try the new filter feature!!!! Thanks for providing such a great product!